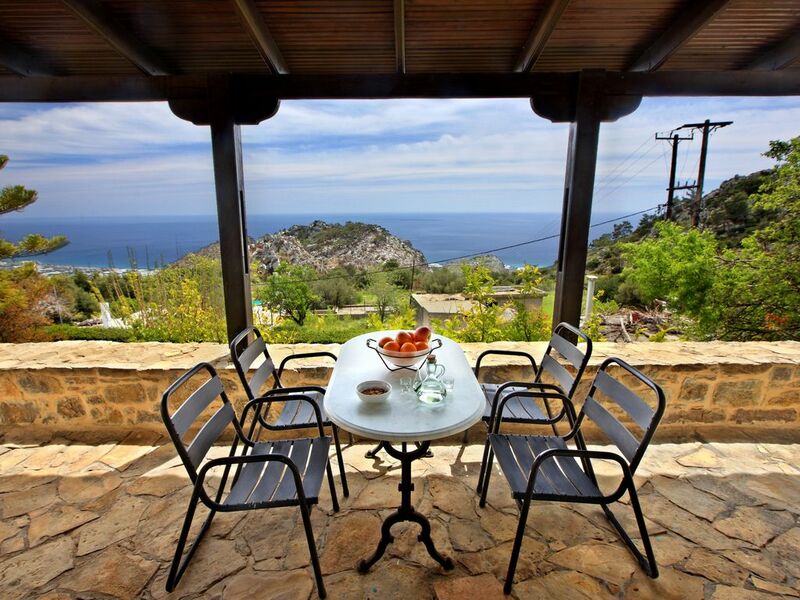 Traditional house in Crete with amazing views, Sleeps 3 people. It is 90m2 with a bedroom, bathroom, living room and fully equipped kitchen. This charming traditional ground floor house has outstanding panoramic views of the blue Mediterranean Sea and Chyrsi Island. It is 70m2 with a bedroom, bathroom, living room and fully equipped kitchen, recently decorated in the Cretan style. There’s a double bed in the bedroom, and a 1 ½ size bed in the living room. It has a large outdoor area for al fresco dining, surrounded by low stone walls over a stepped garden. It is in a sleepy traditional village, located 100km from Heraklion airport, 32 km from Agios Nikoloas, and just 14km from Ierapetra. There are lots of incredible beaches nearby, with the nearest only 20 minutes’ drive away. The house is perfect for relaxing and getting away from it all!